Two councils trying to oust a member living 400 miles away from his ward have written to the government asking for a change in the law. Donald Adey, who represents Trumpington on Cambridgeshire County Council and Cambridge City Council, moved to Fife. He only has to attend one meeting every six months to avoid being disqualified and, so far, Mr Adey has not fallen foul of this rule. Both authorities have accused him of "twisting the system". Mr Adey, who has been an independent since quitting the Liberal Democrats in 2018, moved to Cupar a year ago. Colleagues said they have had to take on his ward casework due to his absence. In a joint letter, the two Cambridgeshire authorities have called on James Brokenshire, the Secretary of State for Housing, Communities and Local Government, to act. "A loophole in current legislation has permitted a councillor to move a significant distance away and twist the system to remain in post by making infrequent token appearances, and thereby draw in this case approximately £15,000 a year in allowances they cannot evidence is justified. "Worst of all, residents of that ward are missing out seriously on effective representation." The leaders are calling for councillors who move further than a "normal commuting distance of 50 miles" to be "considered to have vacated their seat" after six months or more, requiring a by-election to be called. In order to speak to Mr Adey, a journalist from the Local Democracy Reporter Service travelled to Cupar, where the councillor admitted his case was "unusual". 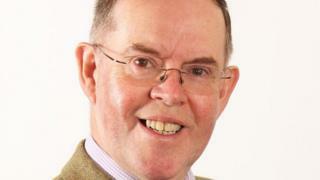 Lewis Herbert, leader of Cambridge City Council, described Mr Adey as "out of touch with reality". Mr Adey has again been contacted for comment.